Hello Friends welcome back for another Wednesday Project...using Brutus Monroe Stamps and products, every Wednesday you can find a Blog Hop at the Brutus Monroe Blog featuring a product or technique of the week! 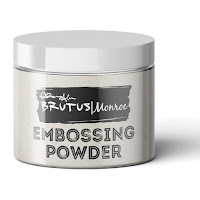 This week we want to share with some halloween inspiration using our favorite Brutus Monroe products and also a fun Give away!!! Brutus Monroe will be giving away ONE $25 GIFT CERTIFICATE to the Brutus Monroe store... Just leave a comment on each blog post along the hop to be entered!!! Winner will be announced on next Wednesday´s blog hop post. November 7th, on the Brutus Monroe Blog. 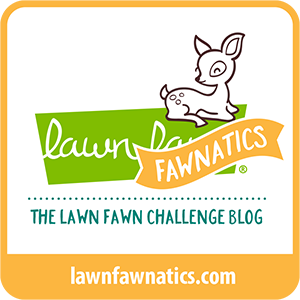 Please remember to check back next week to see if you are the winner!!! 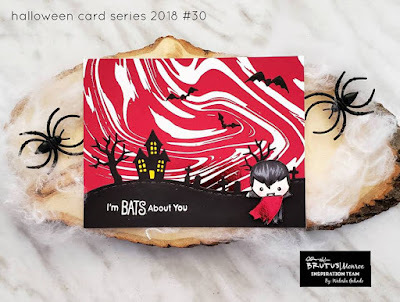 ***BONUS ENTRY***- Post ANY project you have created in the Brutus Monroe Fan Club group on Facebook with the Hashtag #trickortreatgiveaway Good Luck everyone!! To create this card I was very inspired by the Designer Toner Sheet Marble I totally think It looks like a spooky night sky... So I wanted to create a spooky night scene. I started by foiling the toner sheet with red Deco Foil. That was the base for my scene... With Raven cardstock I cut a halloween border and to make it even more spooky I add some bats flying around. 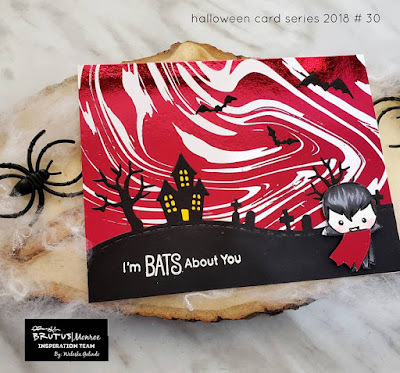 I stamped the Vampire and I wanted to make his cape shinny, to make that I also foiled only his cape by stamping it on a black toner sheet and I foiled it with the same red foil I used for the background. I finally stamped the sentiment with Alabaster Embossing Powder. Hop along with us for more Halloween inspiration!!! What a wonderful way to use that toner sheet. You guys just blow me away with the things you come up with. Thanks for sharing. I love that you used the toner sheet with the foil to create your spooky night sky, because I can totally see that and I think it looks awesome! 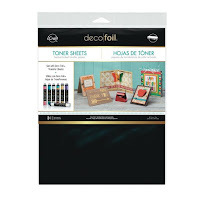 I am loving seeing all the crafts that are using the foils, who can resist the shine & sparkle hehe! Thanks for sharing your work! Wow - the color! That is such a cool scene you created! That marble toner sheet is so versaltile. Pefect for your card. Cute card. 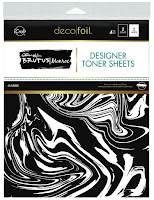 The marbled toner sheet is incredible and amazing. It really sets the tone of the card and love how it is versatile and can be used in so many ways. The complete scene is awesome and love the vampire, he is so cute. The background is awesome! Thanks for the inspiration. I have never used toner sheets, but love the technique! Awesome card! Love the red marble design for your background! Love the foiled red cape on the vampire too! Great scene! Fabulous background, what a great idea! amazing still learning about toner sheets etc but this is beautiful!! Cool red spiral foiled background! Very clever! 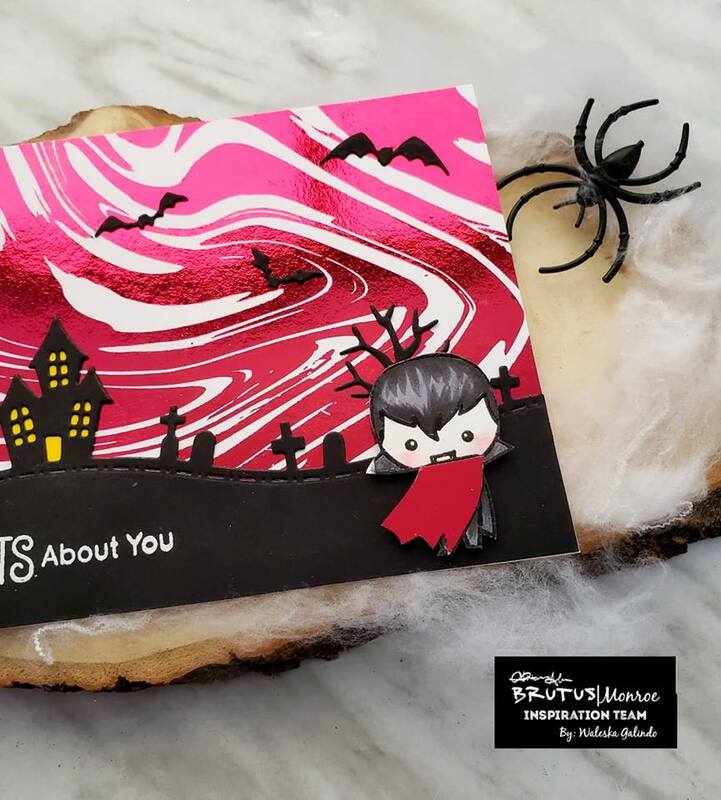 And your little Dracula is so adorable too! Love your card. You are super talented! Love all your cards! I loved your card. It is very original using red as focal point. Very refreshing. Loved your background... great card! Stunning. It looks like swirling vampire blood. I bet that background is even more pretty in person. 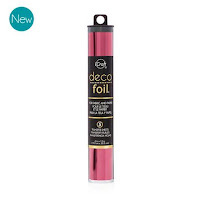 Can't wait to try foiling one day soon. What a unique card for Halloween! Very bold color choices. What a cool card. I love that you used the red with the vampire. Very unique. Thank you for sharing!! Now I'm even more excited to try foiling techniques! What a great looking card! Nice job, Waleska...Thnx for sharing. I like your spooky sky and scene. Welcome and Thanks for visiting my blog. 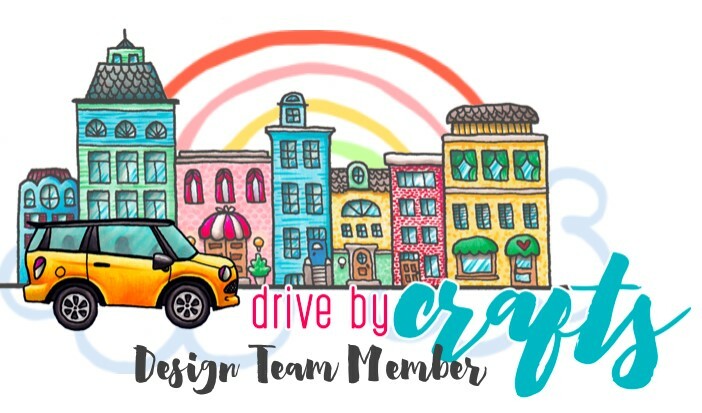 I am a Cardmaker and Crafter from Guatemala that is in Central America :) I am also a Graphic Designer, I began cardmaking in 2012 but fell in love with stamping on 2015 and now I am a card addict.... I am a Mom of two wonderful and full of energy kids and wife to an amazing husband that supports me always!! 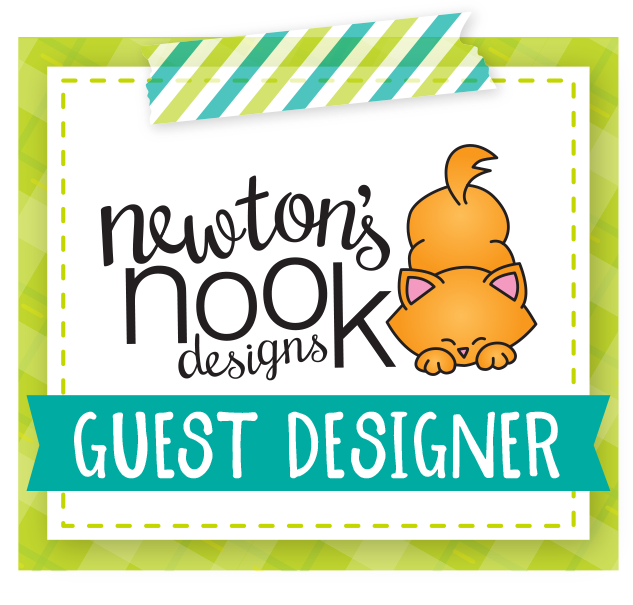 This is my cardmaking and life journey...! !